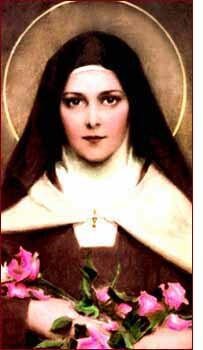 One of my dearest heavenly friends is St. Therese of Lisieux. She inspires me day after day, especially with her simple desire to love. She speaks of a profound truth in the following poem. If I can "just for today"...LOVE...both the receiving and the giving of...because she understood by divine grace, that is who she is and that is who we are...LOVE. And love is present...it is now, not tomorrow. Oh, I love you, Jesus! My soul yearns for you. O Divine Pilot! whose hand guides me. I'm soon to see you on the eternal shore. Ah! Lord, let me hide in your Face. There I'll no longer hear the world's vain noise. This cluster of love, whose seeds are souls. Giving Jesus to me and uniting me to Him. My Holy Guardian Angel, cover me with your wing. With your fire light the road that I'm taking. But still exiled, far from you, I languish. When the day without sunset will dawn on my soul. This poem is so beautiful, Sheila! It’s wonderful to hear from you! So interesting, isn’t it, to hear Therese’s voice in this poem? She certainly stepped out of chronos into kyros—God is now!! May you do the same as the snow falls around you.